A seminar took place in the central province of Quang Nam on December 12 to discuss ways to protect the grey-shanked douc langur found in the local Nui Thanh district. About 50 individuals of the rare species reside across 25 hectare of natural forests in Nui Thanh’s Hon Do mountain. Currently, Quang Nam in collaboration with the biodiversity preservation centre Green Viet are running a project on conserving the langurs in Nui Thanh for 2019 – 2028. The project costs over 100 billion VND (4.3 million USD), of which 63 billion VND (2.7 million USD) are sourced from the State budget and the rest funded by some international organisations. According to the Green Viet, the langurs are the only group in the world that can be easily observe in the wild. The findings mean a great opportunity for research and conservation work, but present a risk of being hunted by locals and poachers for the animals. At the seminar, Nguyen Van Thinh, Vice Chairman of the Nui Thanh district People’s Committee, recommended the conservation project pay attention to the development of sustainable tourism to create better livelihoods for local residents and reduce human impacts on the habitat. Bui Phuoc Chuong, a biodiversity expert, said Quang Nam’s ongoing work to expand the 25 hectares to 100 hectares is key to increasing the habitat area and to tackling the separation and isolation of the herd due to locals’ production activities. The protection of the group must be intertwined with associated scientific research, education, and conservation genetics, he advised. 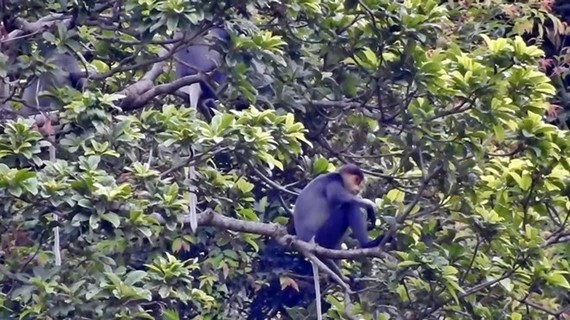 Vietnam houses between 1,500 to 2,000 grey-shanked douc langurs in forests across the five provinces of Quang Nam, Quang Ngai, Binh Dinh, Kon Tum, and Gia Lai. The langur is listed on the International Union for Conservation of Nature red list as one of the world’s 25 critically endangered primates.